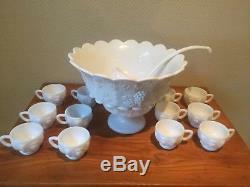 Westmoreland milk glass punch bowl set, grapevine, with 12 cups, stand and ladle. The item "Westmoreland paneled grape milk glass punch bowl set with 12 cups, stand & ladle" is in sale since Monday, September 10, 2018. This item is in the category "Pottery & Glass\Glass\Glassware\Elegant\Westmoreland\Paneled Grape". The seller is "carrollton35" and is located in Saint Louis, Missouri. This item can be shipped to United States.